The press has been replete with worries of failing oil demand. This is always a possibility. But as a practical matter, demand had not collapsed as of Oct. 10th, according to the EIA. 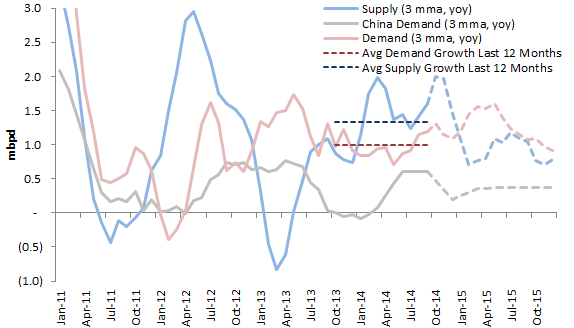 Over the last 12 months, demand growth has averaged 1.0 mpbd / year. For September 2014, this number was 1.19 mbpd, above average for the last two years, in fact. On the other hand, supply growth has been impressive. It was up 1.6 mbpd in September, 400 kbpd ahead of demand. On average, supply has exceeded demand by 300 kbpd since January of this year. Might demand fall with weakening European and Chinese economies? Possibly. But lower oil prices could also stimulate demand. Indeed, little more than a week ago, the EIA expected demand to outrun supply again by early 2015. We will see. But for now, the story is primarily on the supply side. Surging North American unconventionals and the return of Libyan production have been more than could be easily absorbed by the global economy. Did the ECB Tank the Euro Zone?